Royal Dux Porcelain has been produced since 1853, in the small town of Duchcov, located about two hours to the North West of Prague, the capital city of the recently formed Czech Republic. From 1918 until December 31st 1992 the country was known as Czechoslovakia, situated behind the so called “Iron Curtain” from 1948 till 1990. As the Berlin Wall crumbled so did the hard line communist government in Czechoslovakia. The “Velvet Revolution” (so called because of its lack of blood-shed and violence) began in November 1989, in the streets of Prague, initiated by students, but supported by the entire country. In January of 1990 Vaclav Havel (the famous dissident writer) was elected president of a free Czechoslovakia. However, in the winter of 1992 the Czech and Slovak factions decided to split and form two separate countries, The Czech Republic and the Slovak Republic. This split has become known as the “Velvet Divorce”. Today the Czech Republic is a thriving country on the rocky road back to capitalism. Tourism is absolutely unbelievable, with millions of visitors per year. The country is very beautiful and full of historical buildings, castles and natural wonders with at least five different sites, (one of them being the city of Prague) protected by UNESCO. 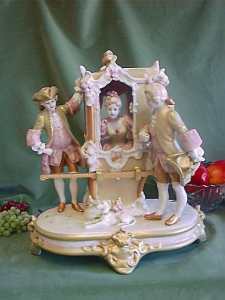 From Nazi occupation just before World War II, all the way through more than forty years of communist tyranny, the Royal Dux factory never stopped to produce the beautiful porcelain pieces, figures and figurines for which they are so famous. Now, no longer part of a huge government owned monopoly, Royal Dux Porcelain has now been fully privatized and is making great strides to return to its once impressive past. Although most “Westerners” don’t realize it, the short time span between World War I and World War II was all that was needed to give the Czechs a chance to become one of the five wealthiest and most industrialized countries in the world. This era is most often referred to as “The First Republic” and holds a fond place in the hearts of all Czechs. 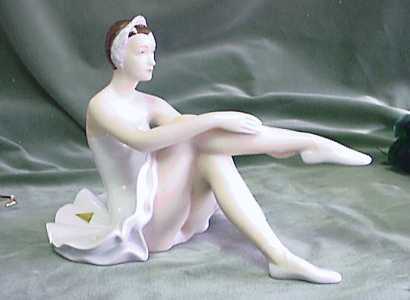 Before the Nazi invasion in 1938 the company had produced over 12,000 different molds and exported beautiful porcelain and faience figurines all around the world. 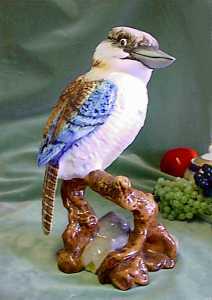 The fall of the Iron Curtain has made it possible for all lovers of fine porcelain art to once again have access to the amazingly wide range of porcelain items that are produced at the Royal Dux factory. However the fall of the communist government in 1990 brought about many new and painful changes which have, at times put the company’s survival in peril. Changes in management and chaos followed the revolution and for a time no one was sure what was going to happen. With the lack of accountability always comes fraud and deception and the Royal Dux factory suffered its share. Huge amounts of inventory “mysteriously” disappeared to customers who just couldn’t be located and company assets went missing without a clue as to who could be the culprits. Now the company is in the hands of private owners who have an agenda to put the company back on its feet. The company is in the process of developing its own sales and marketing strategies, which until now were dictated by government owned trade and export companies located in Prague. At the present, some of the molds dating from before WWII are being brought out of the archives and being revamped for production. New decors and glazing techniques are being used, and the company is making plans to produce “Limited Edition” pieces and to begin concentrating more on the “Collectible” market. Fresh ideas are being examined by the new directors and those that are needed will be implemented as quickly as possible. With plans to attend this year’s “International Collectible Exposition” in Rosemont, Illinois, Royal Dux hopes to make a statement to collectors worldwide that Royal Dux porcelain, Royal Dux figurines, and Royal Dux figures will indeed take its rightful place among the world’s top collectibles. These three amazing Art Nouveau centers sold for 75,000 EUR at Balclis Auctions, Barcelona in 2013.